The Cobblers will be launching their new home kit at the the club’s annual Family Fun Day which takes place at Sixfields on Sunday. There are going to be a host of fun activities for the whole family, with the doors open from 10.30am. Those fans who turn up can see boss Justin Edinburgh putting the Cobblers players through their paces from 11am as they put on a public training session. 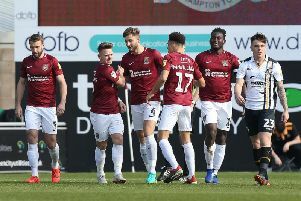 All young supporters, aged 11 and under, will also get the chance to go on to the Sixfields pitch and take on the first team squad in a giant game of football. The club is then aiming to break the record for the biggest ever team photo, beating lastr year’s effort, involving players, club staff and supporters in the west stand. The players will be on hand throughout to meet supporters, sign autographs and pose for pictures, while stadium tours will run regularly from 12.45pm, leaving from the main reception. In addition to what is happening inside Sixfields, there are plenty of fun activities planned outside the stadium too.